Our new lead generation module is *ahem* pretty awesome. Go the ‘Collect leads’ step in your Riddle. Click on ‘Create a form’ and select ‘Lead generation form’. Choose the row widths (ex. 1/3 and 2/3, or 1/2 and 1/2). Drag and drop the fields you need. Edit the field names and messages to suit your needs. Want to use a form in other quizzes? Check out how our form templates will save you time. 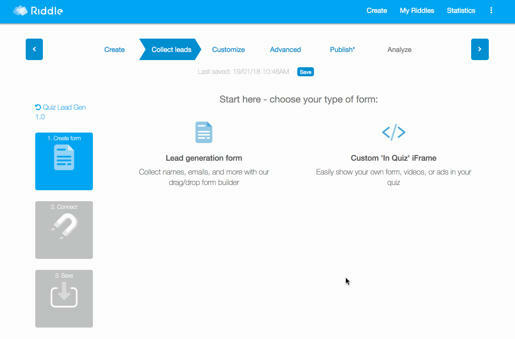 And here’s a video overview of our quiz maker’s lead generation form builder – but give us a shout if you have any questions at hello@riddle.com. Want to customize your form’s send/submit buttons? Change everything from the position to the colors/opacity of your send/opt-out buttons. *** Not a Riddle user yet? Try a free trial – no card needed.